Autumn is a season marked by change. Weather this transitional season with grace by working diligently, celebrating responsibly, sharing the bounty, preparing for winter the holidays and incorporating other lifestyle practices from the Sustainable Autumn Living guide into your day-to-day life. 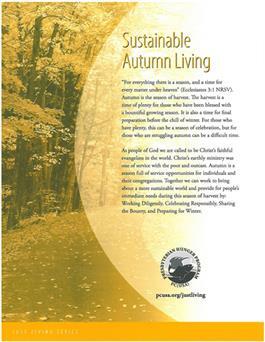 Part of the Just Living series from Enough for Everyone and the Presbyterian Hunger Program.